Kumble, Aug 25, 2018: Talapady-Kasaragod road is a complete mess and travel hazard. 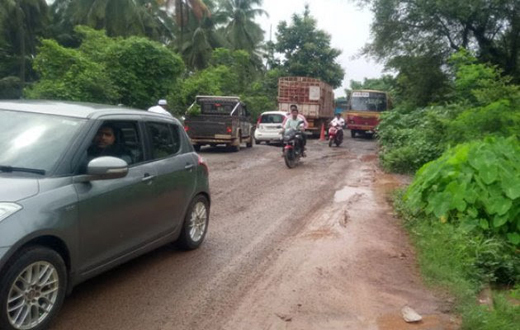 The road in front of Kumble temple, Arikkadi, Mogral, Koppala, Mogral Puttur, Chowki, Adkattabailu, Karandadkadu and other places resembles a cross country track. The potholes on the road cause vehicle queues that last for hours together. This usually results in road rage and and fights. The public’s help is indispensable to pull out small vehicles stuck in potholes. In the guise repair work, gravel has been dumped beside the road. At some places, the road with potholes is being dug up through JCBs. But, if one place is repaired, new potholes appear. Serious Hazard : Traveling along this road is a challenge and those seated on the last rows of the bus, usually end up suspended in the air on this route. The bouncing buses not only damage themselves but also incapacitate many passengers. The pothole rich road makes sure that the buses can never maintain their time schedule. Most travelers have now given up the road route for good and instead prefer to travel via train. But, this is possible only for a limited period of time. The previous and current government failed to acquire land required for four laning within the required time period and consequently has led to the cancellation of the tenders. As of now, now work has been initiated to widen the road. The stone markings done by the revenue department along private properties which were supposed to be acquired have disappeared without a trace. Yet, the government assures that the work will continue in December. But, the public fears that if the potholes along the road are not repaired with haste, it will lead to even more accidents along this route and in the coming days may completely stop all vehicular movement. Therefore, instead of giving the lame excuse of the monsoon, the responsible representatives of the people and PWD officials, must wake up take action to provide an alternate solution to the problem.